In a one-quart glass bowl combine chocolate and cream. Heat in microwave oven on high 1-1/2 to 2 minutes, stirring occasionally, until smooth. Add butter and stir until melted. 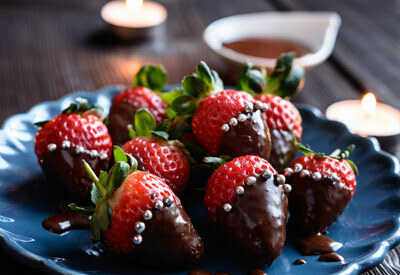 Holding the stem end of the strawberry, dip each strawberry into the chocolate mixture so about one half of the strawberry is covered with chocolate. Remove the strawberry and allow the excess chocolate to drip back into the bowl. If necessary, add additional cream to the chocolate to achieve desired coating consistency. Transfer the coated strawberry to a baking sheet lined with foil or waxed paper and repeat process. Allow the chocolate to cool. Press dragees around the edge where the chocolate meets the strawberry. Chill the strawberries until the chocolate is set, about 20 to 30 minutes.